You are here: Home / Bahamas / Florida, St Barths or France? We’re proud to re-introduce the 72ft Chesapeake Bay boat to the charter market. Based along the east coast of Florida, she is the perfect charter yacht for a trip across Lake Okeechobee, or gunk-holing down the waterway. Ideal for 4 guests or family of 6: Master cabin aft of bridge with double bed and ensuite head with shower. 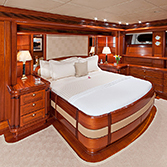 Newport Suite on deck with 2 large twin beds, with ensuite head. Bunkroom below decks shares crew head. Guests are looked after by the QUEEN’s dedicated crew, Deacon Nelson and Penny Gehring. Deacon has been keeping the QUEEN in Bristol fashion for the past 30 years. Thanks to Penny, all guests on board eat sumptuously healthy food with a few naughty treats thrown in for fun. Email Chip Barber at Chip@sandersonyachting.com or phone (434) 409 0054 for availability. COASTAL QUEEN charters for $22,000/week plus expenses. 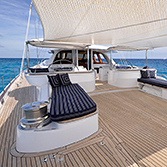 The unmatchable 155ft sloop, HYPERION, is available for charter for the 2016 St. Barths Bucket, March 17 to 20, 2016. HYPERION has competed in, and won, many of the world’s Superyacht races since her launch in 1998. Having just completed a 9-month, multi million dollar refit at the Royal Huisman Yard in Holland she is ready to win her class in the 2016 Bucket! The charter fee for the 2016 Bucket is $115,000 and includes the 27 additional race crew and their expenses as well as the regatta entry fee! The usual charter expenses will apply, food, beverages, local tax, mooring fee (she draws too much water to get into the dock in Gustavia). Depending on the level of racing, additional insurance may be required. 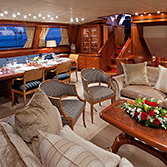 Up to six guests are accommodated in three cabins, each with ensuite facilities. Guests are looked after by Captain Daniel Rawlins and his crew of seven. Link to Crew Profile. CLAIRE DE LUNE is a deluxe hotel barge tastefully furnished providing superior accommodation for up to 6 guests in three contemporary double or twin junior suites with en suite facilities, making her ideal for family charters. There is a comfortable, stylish dining area and saloon with picture windows and a large sundeck with a spa pool from which to admire the passing countryside, together with bicycles for exploring the towpath alongside this famous waterway. While cruising the canal between the charming village of Le Somail and the fortified city of Carcassonne, guests will discover some of the most beautiful scenery in the south of France along the way including visits to historical sites such as the spectacular Cathar village of Minerve, the elegant city of Narbonne. Link to Itinerary. Departing every Sunday, charter fee includes all on-board meals, open bar 24/7, excursions and admittance fees as per the itinerary and use of all the barge’s amenities – bicycles and spa pool. Charters end on Saturday after breakfast.